Thanks to Carol Fragale Brill of 4 Broad Minds for tagging me in The Next Big Thing Blog Hop. Carol’s new novel, Piece by Peace is coming out very soon and I am excited to read it. I have read all of Carol’s thoughtful reviews of other books, and I have a feeling her novel is going to be a good reading experience. What is the working title of your book? Perigee Moon (Just typed “perogee”, isn’t that some sort of Polish potato treat?) But a definite maybe for the title of an oncoming new novel. Perogees at Noon. Where did the idea for the book come from? One night, in Clearwater FL, I was awakened by the full moon shining in the window. I got up to go outside and look, and take pictures of it. It was so bright that the sky appeared burnished, more brown than black, and the moon glowed a bright gold and little wispy clouds floated past it. Later, I learned the reason it seemed so ethereal (fancy-schmancy word which means “real purty”) was because it was one month before the Perigee Moon, when the moon appears much larger to us earthlings. It was a nature phenomenon when one thinks about how we are all pretty insignificant in the grand scheme of the solar systems. I got the idea of a character feeling that same way. Later it evolved into him having an “oh I get it now” moment when he views the Perigee Moon. Then the idea of the controlling woman, the bad marriage, the change in lifestyle the character wants to make and finally, the reconnection with a woman from his past. What is the genre of the book? It is women’s fiction, and as a sub-genre it is baby boomer lit, since the character grew up in the fifties/sixties. Or maybe it’s the other way around. Big boom in boomer lit these days! Which actors would you choose to play the characters in a movie rendition? For the main character, Bradley Cooper. Demi Moore for Kate, since she did such a good job of sexually harassing Michael Douglas in Disclosure. Perhaps Diane Keaton for Abby. Think these actors are up for this challenge? What is the one-sentence synopsis of your book? 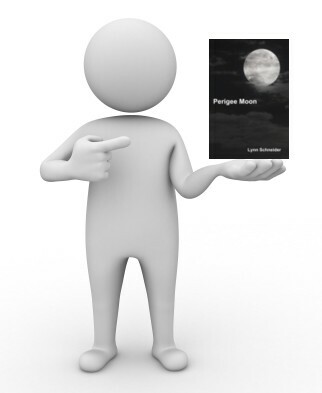 Perigee Moon is the story of a man who has a life crisis, who comes to realize that he must be true to himself and makes the changes necessary to remove himself from a ruined marriage and the “should do” world in order to have the lifestyle he craves. Will your book be self-published or represented by an agency/publisher? Self-published. I have neither the time nor the patience to do otherwise. How long did it take you to write the first draft of the manuscript? About one year. What other books would you compare this story to within your genre? My other two, Second Stories and Whatever Happened to Lily? No really, I’d like to say works by Elizabeth Berg and Anne Tyler but that is a privileged society of which I am merely one of the unwashed who elbows her way to the front of the line in order to get a closer look at the limo. Who or what inspired you to write this book? I was inspired to try humor. I tried to inject it in certain places, although to say it’s a real thigh-slapper would be frugal with the truth. Whether the attempts at humor worked or not, I am not sure. Like everything else, humor is personal. What’s funny to one is inane or misunderstood by another. There are a lot of my own reflections in it, especially the “workspeak” where Luke has his second epiphany about where he should direct the rest of his career. Things that became intolerable to me, found their way into this novel. Sometimes we need to step back, take a look at what we’re doing, decide if it is providing the satisfaction we crave, or whether we’re like the proverbial hamsters, doing what we do because it’s what we do and what we’ve always done. What else about your book might pique the reader’s interest? It’s a nice story. It’s a character-driven novel, and those characters are, I think, believable. And everyone can relate to what happens to Luke. We make choices when we’re young and sometimes they aren’t the correct ones. We turn left, but a right turn would have been better. (No pun intended. Ah. The English language, so ripe for punnery.) We can watch a character become true to himself, and instead of doing what others want, he learns to do what he wants. Now it’s my turn to tag three great authors. I’d like to pass this opportunity on to Jenny Gill, Johanna Van Zanten and June Collins. These women have become good cyber-friends of mine and I have read an reviewed all their books. This entry was posted in Perigee Moon, Writing and tagged blogging, boomer-lit, Perigee moon, The Next Big Thing Blog Hop, women's fiction by Lynn Schneider. Bookmark the permalink. You’re right. I had originally said Kevin Costner but then saw BC on the Globes last night, and he comes close to what I had pictured. The makeup guys would have to make him older when he meets up with Abby. I think Diane Keaton is quite a personality, but yeah, she needs a bit of filtering sometimes. As always, thanks for reading. Thanks, Sarah. It’s likely I may be one of the last stops on the Blog Hop but I had to get in on it. Glad you liked the answers! BC is going to be busy. I am looking forward to your book, Carol. I really love the image you’re working with, of the moon so large. Its a little eerie but it’s also so comforting at the same time. Like the universe turned toward us humans just for a moment to take a quick peek.